I always find these studies fascinating. And wonder what conclusion would be reached if many minds were brought into an international project, including the minds of sociologists. It has been sometime ago, but I remember a theory about three ‘Eves’, including an Asian ‘Eve’, and African ‘Eve’ and a Middle Eastern ‘Eve’. If that theory holds up, it would make sense that the domesticated dog has its own ‘Eves’. Canines are nothing if not opportunistic! 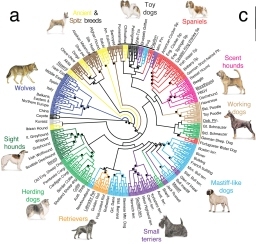 Dogs likely originated in the Middle East, not Asia or Europe, according to a new genetic analysis by an international team of scientists led by UCLA biologists. The research, funded by the National Science Foundation and the Searle Scholars Program, appears March 17 in the advance online edition of the journal Nature.